Cataract surgery is the most common outpatient surgery performed in the United States today. In order to understand how laser cataract surgery can offer better results than traditional surgery, it is important to understand why and how traditional cataract surgery is performed. A cataract is a clouding of the eye’s lens that eventually results in decreased vision. Cataracts require treatment when visual impairment begins to interfere with the individual’s daily life. The only way to correct a cataract is through surgery. Cataract surgery has a very high success rate, with more than 90% of patients achieving corrected vision of at least 20/40 after surgery. In Orange County, Beach Eye Medical Group is the premier eye surgery center for all your eye surgery needs. Cataract Surgery is performed by Dr. Samir A. Shah, who provides meticulous care from the initial cataract consultation through the laser cataract eye surgery. Dr. Shah is a Huntington Beach cataract specialist who completed one of the most prestigious surgical fellowships in the world at Johns Hopkins Hospital, which was rated by U.S. News and World Report as the best hospital in America 22 times in the last 24 years. Only four residents (physicians-in-training) in the country are selected for this highly coveted fellowship every year. He has trained with the world’s leading physicians, some of whom invented many of the techniques and tools used in modern cataract surgery. His passion for providing patients excellent vision is evident in the skill by which he personally performs each cataract surgery. His stable, capable hands make him the absolute best choice for patients who live in Orange County, California and are looking for a laser cataract surgeon. 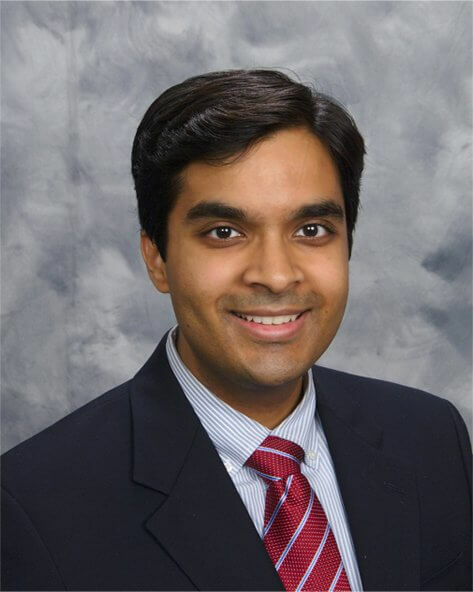 Dr. Shah only performs surgery at state-of-the-art surgery centers in the area. He is trusted by his colleagues to perform surgery on their own family members. A variety of physicians including radiologists, anesthesiologists, OB/GYN, optometrists, chiropractors, and other physicians have trusted their eye surgery to Dr. Shah. While the national complication rate for cataract surgery hovers around 2-3%, Dr. Shah’s complication rate remains nearly 0%. Anesthetic eye drops are applied to numb the eye and prevent discomfort. Incisions are created in the cornea to provide access to the lens capsule and allow insertion of surgical instruments. A circular incision is made on the surface of the capsule that houses the lens. The most popular method is phacoemulsification, which uses ultrasound energy to break the lens into tiny fragments that are gently sucked out of the eye. The IOL is folded and carefully inserted into the capsule where it gently opens and settles into its functional position. The incision is sealed and antibiotic eye drops are applied, if necessary. What Makes Laser Cataract Surgery Different? Traditional cataract surgery includes transplanting a monofocal lens to replace the natural, cloudy lens that was removed from the eye. Monofocal lenses allow you to see objects at distance but in order to read books or use a computer you will probably need reading glasses. Customized cataract surgery includes the latest generation of artificial intraocular lenses that let patients see near and far, dramatically reducing your need for eyeglasses. This category of IOL’s may include multifocal IOL’s such as the Restor or Tecnis Multifocal and accommodating IOL’s such as the Crystalens. Beach Eye Medical Group, located in Huntington Beach, is the exclusive provider of the CLEAR Upgrade® in Southern California. CLEAR stands for Custom Lens Exchange and Astigmatism Revision. Many patients suffer from both astigmatism and cataracts. In these cases, simple cataract surgery will not result in clear vision. Using the laser, specialized, meticulous incisions can be made on the cornea to reduce the astigmatism level. For those patients that require treatment of a higher level of astigmatism, specialized intraocular lenses called Toric IOL’s may be used to neutralize the bulk of the astigmatism. Different types of toric intraocular lenses include Alcon’s AcrySof Toric lens implant, Trulign Toric Lens by Bausch + Lomb, and the TECNIS Toric IOL. For patients who suffer from various stages of open-angle glaucoma, a relatively new group of treatments are available known as Micro-Invasive Glaucoma Surgery (MIGS). Glaucoma is a painless disease often discovered too late, when vision loss has already occurred. During your cataract surgery, a MIGS procedure can be performed in the eye that can improve the drainage of fluid from the eye thus leading to a more controlled intraocular pressure. If you have been diagnosed with cataracts, we encourage you to schedule a consultation with Dr. Shah at Beach Eye Medical Group in Orange County – call (714) 312-1442. Drawing upon his wealth of experience and superior surgical skill in performing all types of cataract surgery, Dr. Shah will help you determine which surgical approach will best meet your needs. He takes the unique needs of each patient into account before recommending any type of surgery. Rest assured that you will be given the expert guidance you need to make this important decision easier for yourself. Contact us today to schedule your appointment at our Newport Beach surgery center or our Huntington Beach office. Irvine, Fountain Valley, Westminster, Costa Mesa, and Tustin.